Raza Hasan is a proselytizer for fixed-fee billing. Which may seem odd, given that his company, TimeSolv, sells a product for lawyers to track their time by the hour. But what is not so obvious is that the same product can be used to bill on a fixed-price basis – and to ensure, Hasan says, that lawyers do so profitably. It is a feature he would like to see every lawyer begin to use. But a major obstacle that keeps lawyers from adopting fixed fees is their fear that services provided at a set price will not be profitable, Hasan believes. That fear is fueled by a lack of technology to help lawyers intelligently price their services and budget their time. So how does TimeSolv, a cloud-based time-and-billing program, help with fixed-fee billing? Read on. TimeSolv’s meat-and-potatoes functionality is tracking hourly time. One of the earliest cloud-based products for lawyers, it was originally developed by Thomson Reuters in 1999 and then spun off as a separate company in 2006. As TimeSolv has developed over the years, it has evolved into a kind-of practice management-lite application, allowing not just time and billing, but also basic management of clients, matters, calendars, tasks and documents. It even has a document-automation tool for creating document templates. While most cloud applications open to a dashboard of some sort, in TimeSolv, the user starts in the time-entry screen. It provides various tools for quickly entering time as well as for tracking time entered. The main time-entry fields are pretty much what you’d expect. Pick a client or matter, add task codes if you use them, put in your time, and add a description. TimeSolv lets you create a “cheat sheet” of two-letter abbreviations you can type to quickly enter commonly used descriptions. In fact, you can have two cheat sheets, one generic to your firm, the other personal to you. As you’d expect, TimeSolv also has timers to track your time. It is easy to start a timer and to switch among timers for multiple matters (such as when you stop work on a brief to take a call). A desktop widget lets you track time even when you are offline. An interesting feature of TimeSolv is the ability to create matter plans. In a matter plan – you might also call it a matter budget – you break down a matter by its stages or tasks, assign responsibility for each stage to an attorney in your firm, and set the hours to be spent on that stage. In this way, each attorney knows what he or she is expected to do and the amount budgeted for completing it. Once the plan is created, attorneys can then enter time hourly, as usual, or by the task. For example, if they are assigned the task of “discovery,” then once they’ve completed it, they can simply select that task to enter the budgeted time. Charts available from the main page show each attorney’s progress with respect to the plan and budget. So what does all this have to do with fixed-fee billing? As I noted at the outset, Hasan believes that an impediment to fixed-fee billing is attorneys’ fear that it will not be profitable. But the same budgeting tool I just described can be used to accurately plan and budget fixed-fee matters and therefore ensure profitability, he says. At the outset of a matter, the attorney would budget the tasks and time, just as described above. Based on that budget, the attorney can then determine a fixed-fee price for the matter. Provided that the attorneys stick to the budget, they can be confident that the matter will be profitable. Further, by setting time targets for each task, attorneys are motivated to be more efficient and make better use of their time, Hasan believes. Without a set target, we tend to spend more time than is necessary on a task. Once you create a budget for a matter, you can then save it as a template. Thus, if you frequently handle matters of the same type (as most attorneys do), you can create a fixed-price template to use across all of them. Even for a fixed-fee matter, you can still enter your time as described above. However, if you try to enter time beyond what you’ve budgeted, TimeSolv will not let you enter it. If you do exceed your budget, Hasan’s suggestion is that you go back to the client, explain why you are required to spend more time than expected, and ask the client for an additional fee. However, you will be glad to know that there is also a setting in Timesolv that can override this automatic block. 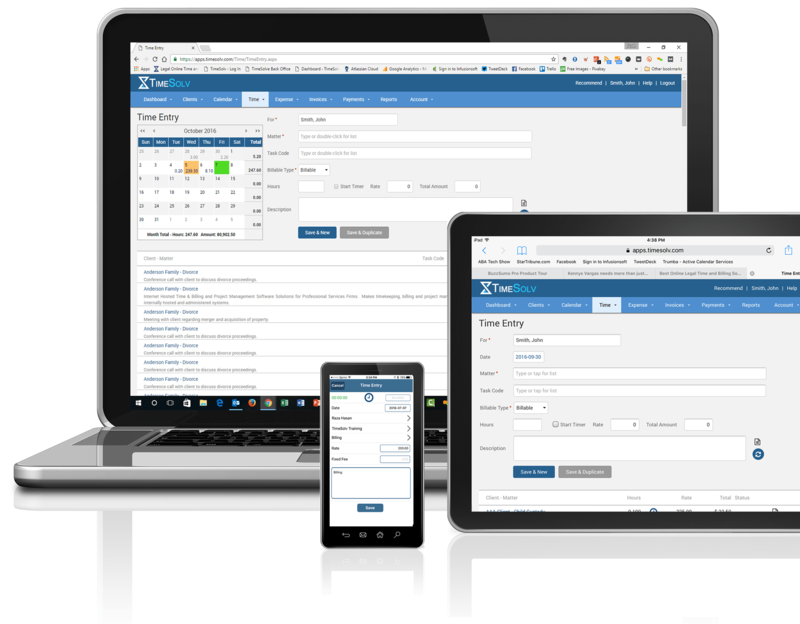 TimeSolv includes the ability to generate invoices and receive and track payments. It integrates with Lawpay so that invoices can be sent by email and clients can pay online, with no login required. Invoices can be set up for either hourly or fixed-fee billing and can be customized to add or exclude various fields. TimeSolv also allows split invoicing, meaning that you can easily divide fees among multiple clients. As I noted above, TimeSolve is not just for time and billing. You can use it to track clients and matters, store documents for matters, and manage calendars and to-do lists. It has a rich set of reports that you can generate. Among them: time entries, missing time, accounts receivable, aged invoices, invoices and work-in-progress aging, realization per client, realization per professional, profitability per professional, revenue, and more. 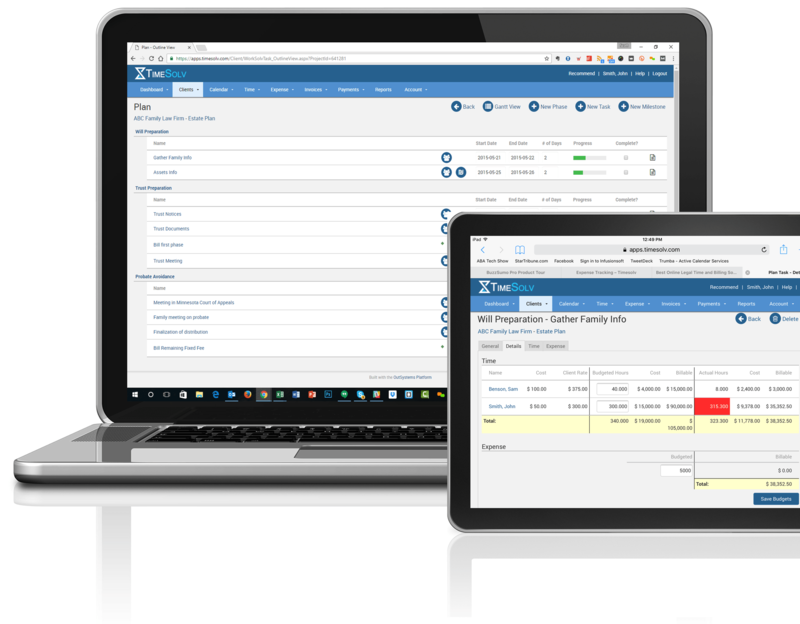 TimeSolv can be synchronized with QuickBooks, both online and desktop versions. It also can connect with both Dropbox and Net Documents for file storage, in addition to its own file storage. A subscription to TimeSolv starts at $34.95 a month for a single lawyer, with the price per lawyer decreasing as the number of lawyers increases. For five lawyers, for example, it is $29.95 per lawyer. A 30-day free trial is offered. Only timekeepers need subscribe. Support staff pay nothing to access the platform. Subscribers get one-on-one initial training and unlimited support. TimeSolv offers a robust library of video tutorials and FAQs and an extensive knowledge base. For lawyers looking to convert from Timeslips, TimeSolv offers automatic conversion of all Timeslips historical data. Conversion is a one-time fee of $850 for one lawyer and then $50 for each additional lawyer.